Here is brain challenge for Solitaire Game players. It is very interesting as well as challenging Mistake Finding Gaps Solitaire Card Game Puzzle. In this Puzzle Picture, there is snapshot taken from Gaps Solitaire Card Game and your challenge is to find mistake in this picture puzzle. Lets see if you can find the mistake in this image? Answer of this "Mistake Finding Gaps Solitaire Card Game Puzzle", can be viewed by clicking on button. Please do give your best try before looking at the answer. 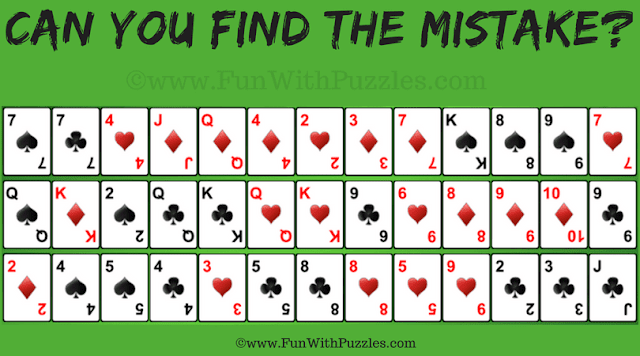 This Mistake Finding Gaps Solitaire Picture Puzzle was tough. It tested your brain power, logical reasoning and observational skills. Do checkout below mentioned puzzles and brain teaser games to test your Maths, Logical and Observational skills. Brain Cracking Maths Circle Puzzles: It contains Maths Logic Puzzles in which your challenge is to find the missing number around the Circle. These Maths Logic Puzzles will crack your mind. Math Picture Brain Teasers with Answers and Explanation : It contains Maths Picture Puzzles in which your challenge is find the missing number which will replace the question mark. Mind Challenging Maths Logical Questions and Answers: It is another set of Maths Logic Questions in which your challenge is find the logical pattern in the given Maths equations and then solve the last equation. Count Number of Triangles-Easy Brain Teasers with Answers : It contains the visual puzzles in which your challenge is to count the number of triangles or squares in the given picture puzzle images. Great. Both of your answers are correct for this finding the mistake puzzle.